German engineering giant Siemens last week confirmed that it has upped its stake in Bristol-based tidal energy firm Marine Current Turbines (MCT) from 10 to 45 per cent. The move, which was signalled last month, indicates a vote of confidence in the UK firm’s technical solution and the potential of tidal power. Experts estimate that at least 10% of the UK’s electricity could be found swishing about the coastline, and around 800TWh around the world. The big advantage of tidal power over wind power is that tides are predictable and reliable. MCT have a come a long way with their Seagen product, which has been in development for more than five years now. The company is now the top electricity producer in the nascent sector, having produce more than 2.7GW of electricity from test rigs off the coast of Northern Ireland. Seagen turbines work using the same principle as wind turbines, catching the movement of water as it flows past, but crucially can be raised out of the water for servicing and maintenance. 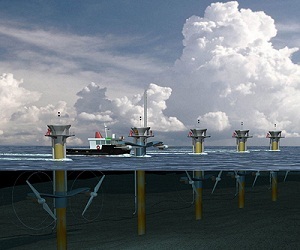 MCT plans to build two tidal arrays, both with a 10MW capacity, off the coast of Scotland by 2014 and Wales by 2015. Next articleHS2 – Will it be big enough and fast enough? How large can shipping go?